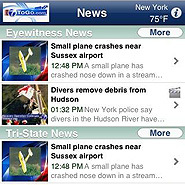 The app, branded as “Local News Weather and More”, displays breaking news, video clips, weather forcasts, sports scores, school closings and more. LSN Mobile’s app utilizes news from its network of local news affiliates which include ABC, NBCU-Telemundo, Cox Television, McGraw Hill, Raycom, Local TV and others. An app for Android and the iPhone are also available.